Talk about a tight range: the August 10Y auction priced at 2.960%. 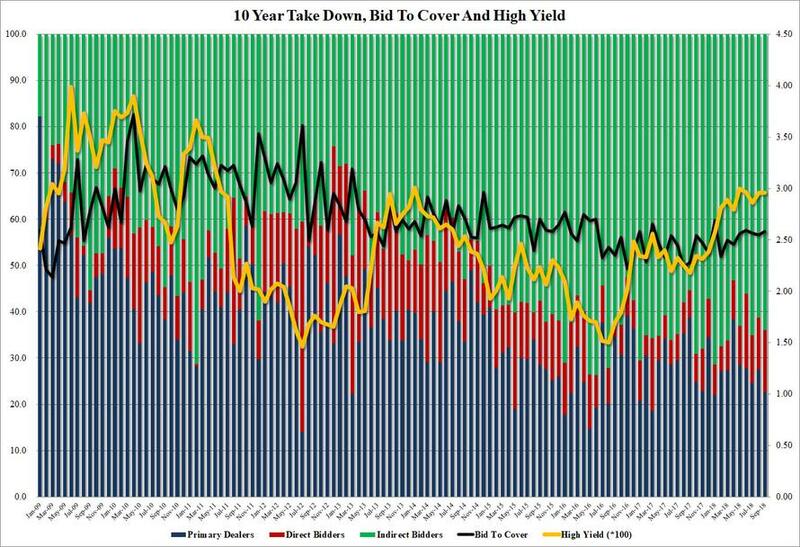 Fast forward one month when moments ago the US Treasury sold $23 billion as part of this week's bond sale deluge (there will be a combined $73BN of 3-, 10- and 30-year Treasury securities to be sold this week, the 2nd largest amount across said tenors in one week since 2010) at a rate of... 2.957%, effectively no change in the yield since August 8. Today's 9 year 11 month reopening stopped through the When Issued by 0.5bps, the biggest stop through delta sine January 2018. Compared to August, the internals were slightly better, with the Bid to Cover rising from 2.55 to 2.58, and above the 6 auction average of 2.54. The Indirect takedown also improved, rising from 61.3% to 64.0%, notably above the recent average of 60.8%, while Dealers took down 22.6%, a drop from 27.5% last month, and below the 29% 6 auction average. This left 13.4% for Directs, the highest since June, and above the recent average of 10.2. Overall, a very strong reopening auction after yesterday's mediocre 3 year sale perhaps the result of the recent selloff in 10Y TSYs, but more importantly, further evidence that despite ever rising debt supply the auction demand remains as solid as ever.